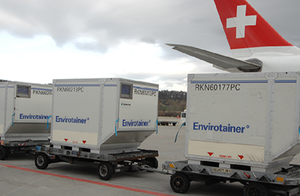 The freight division of the Swiss airline has renewed the Good Distribution Practice (GDP) for handling pharmaceutical, therapeutic products and alike freight shipments at their Zurich hub. The ZRH license was granted by Swissmedic, Switzerland’s authourity responsible for the authorization and supervision of therapeutic products. Back in 2014, Cargologic, the Swiss freight carrier’s ground handling agent at Zurich Airport, was one of the first companies to secure GDP compliance. A year after, IATA followed, certifying the airport as “Center of Excellence for Independent Validators” (CEIV) for its ability to handle professionally and competently the broad range of pharmaceutical products, medicines, vaccines and similar temp critical items. This strategy of setting up certified trade lands, which Ashwin terms as “quality corridors,” is well advanced. By the end of this year, about 50 of these “quality corridors” are expected to be in place, covering top pharma destinations around the world to ensure highest quality standards and product integrity in cold chain handling on a global scale. The project for becoming the benchmark for pharma transports, which other carriers can use as orientation, is not exactly cheap. Over the last couple of years, Swiss WorldCargo has invested heavily in replicating the best practice model in close cooperation with their ground handling partners, reads a release. Part of this quality offensive is to extend their ‘Qualified Envirotainer Provider’ program (QEP) which recognizes the ULD provider’s partner carriers as competent and reliable service providers when handling active cool boxes utilized and leased from the Swedish ULD manager. According to Swiss WorldCargo, as many as 30 stations within the carrier’s network have meanwhile received the QEP accreditation with more to follow shortly. The carrier further announces that the warehouses at their main destinations meanwhile offer controlled Extended Room Temperature Storage (ERT) from +2 to +25 centigrade. This, further enhances the Zurich-based capacity provider’s capabilities in the sensitive field of dealing with temperature controlled shipments, offering clients best-in-class performance.